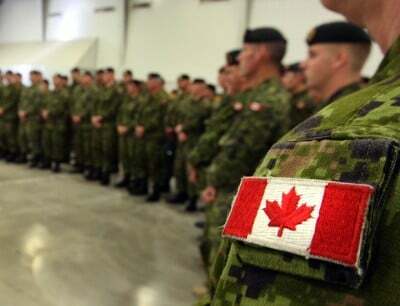 The deployment of Canadian Forces overseas to take part in operations in Syria, Iraq, Libya, Ukraine and Yugoslavia have been and are illegal under Article 31 of the National Defence Act yet not one of the major parties has ever raised this issue in parliament nor have any of the media addressed it any of their coverage of these multiple operations. One has to wonder why it is that the rest of us are required to obey to the laws of Canada but the federal government leadership itself and the Armed Forces are not. (c) in consequence of any action undertaken by Canada under the North Atlantic Treaty, the North American Aerospace Defence Command Agreement or any other similar instrument to which Canada is a party. In none of the situations mentioned in the opening paragraph have these conditions been satisfied. Therefore all these operations have been in violation of the National Defence Act and illegal under Canadian law. It is clear that none of these operations have been conducted under the authority of the United Nations and none of them are for the defence of Canada or in consequence of any action under the NATO Treaty which is officially a defensive alliance and which requires Canada to act only if a NATO country has come under attack, in Europe or North America, and is acting pursuant to the right of self-defence recognised in Article 51 of the United Nations Charter since the NATO Treaty stipulates that NATO actions must be in accordance with member countries rights and obligations under the United Nations Charter. Therefore the Canadian forces military aggression against Yugoslavia in 1999 was in violation of the National Defence Act, as was the Canadian Forces involvement in attacks on Hutu refugees in Congo in 1996,1997 the overthrow of President Aristide of Haiti in 2004, the Canadian Forces operations in Afghanistan, the aggression and destruction of Libya in 2011, and now Canadian Forces operations in Iraq, Syria and Ukraine. Yet it appears that none of the major parties have any respect for Canadian law. None of the government’s or Armed Forces lawyers seem to know the law nor that all orders given Canadian Forces to take part in these operations are illegal under Canadian law. Nor has anyone in the media raised this problem. One has to wonder why. Why have the parties in power and all the opposition parties with seats in Parliament kept silent on the continuous violation of the National Defence Act? Why has no one raised this in the Parliamentary debates about these operations? Why has no one stood up in Parliament and said, “The government cannot do this. It cannot send our forces to this place or that unless the National Defence Act is amended to allow it? Why has not one single journalist mentioned it? The conspiracy of silence surrounding this law, and the real reason Canada continues to violate its own laws to engage in these illegal operations needs to be broken. Something must be said. Something must be done. One thing that could be done is for citizens groups to file an action in the Federal Court for an order for mandamus, that is an order compelling the government to obey the law as contained in the National Defence Act and an order prohibiting the government from further violations of the Act. Citizens have a right as citizens to expect their government to obey the law and since there is no specific remedy contained in the National Defence Act itself whose provisions deal generally with military discipline, an application for an order for mandamus is the appropriate action to seek and one which any citizen could demand. There is no doubt that the federal authorities would resist such an order even being issued by the Canadian courts and would try to argue that citizens have no right or standing to ask for it. But what can be of more concern to any citizen than the use of our armed forces in illegal operations that are spending our money for the benefit of a foreign power and when these operations cause immense harm to the countries and peoples subject to them, and that have brought our nation into complete disrepute around the world? Something has to be done to stop the wars that Canada is taking part in that have nothing to do with and are violations of our obligations under the UN Charter. Since the three major parties, the Conservatives, Liberals and NDP have been co-conspirators in violating the National Defence Act, we can hardly expect them to comply with the law and since the mass media continue to turn a blind eye to the issue it is left to us as citizens to do something about it. The National Defence Act provides us with a tool we can use to try to achieve that.